OneShift is a puzzle platformer from Mazen Games. 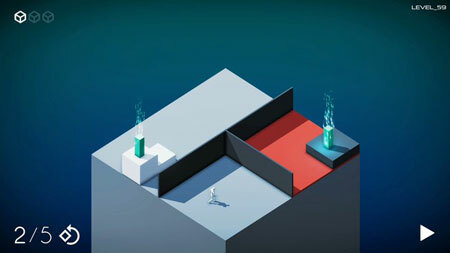 You have the ability to freeze or unfreeze time and shift through worlds to collect blue cubes in the game. But only one world can be active at a time. Later in the game, a world rotating mechanic is unveiled, which makes everything more complex. Shift through the worlds and reach the blue cube. Enjoy in 90 different levels with mechanic of shifting and rotating worlds. Worlds consist of all kinds of different cuboids such as jump cuboids which boost you in the air, teleport cuboids to teleport you from point A to point B, red kill cuboids that will kill you. Exploding bombs that explode on a set timer which you can use in your favor to boost you somewhere. There are 50 levels with only shifting worlds mechanic, 30 levels where you have the ability to shift and rotate worlds, and 10 bonus levels which are filled with insanity. If you get stuck in the game, check out the video walkthrough and gameplay for the game. This entry was posted in PC Games, Walkthrough and tagged OneShift Cheats, OneShift Game, OneShift Gameplay, OneShift Guide, OneShift Hints, OneShift Review, OneShift Solutions, OneShift Strategy, OneShift Tips, OneShift Walkthrough by Marvin. Bookmark the permalink.